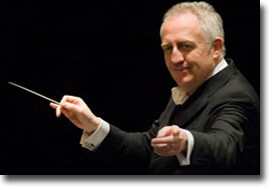 For the final concert in this season’s Tea & Trumpets Series, host Christopher Gaze and the Vancouver Symphony Orchestra led by Bramwell Tovey provide a musical experience from France. The orchestra began with Suite No. 2 from L’Arlessiene, which, if nothing else shows that there is much more to Georges Bizet than Carmen. The orchestra played all four movements, beginning with a flute solo (Pastorale) by Christie Reside and ending with the strident Farandole, incorporating the March of the Kings theme. Younger members of the audience (if indeed there were any) might recognize it from the Atlus video game. Next was Emmanuel Chabrier’s delicate Prelude from Act Two of the opera Gwendoline. The work is considered a neglected masterpiece. Perhaps the infrequency of its staging is partly due to its ridiculous storyline - a pity really, because the music is brilliant. World-class violin soloists have performed Jules Massenet’s Meditation from his opera Thais. This afternoon it was the turn of concertmaster Dale Barltrop to perform this transcription. Barltrop played the piece with the inspired melancholy that the composer had no doubt intended. Though not indicated in the programme, Camille Saint-Saëns’ Marche Militaire from his Suite Algérienne was indeed a welcome addition to the afternoon’s repertoire. Saint-Saëns certainly had an affinity with Algeria and while there are no traditional elements of Algerian music in this work, it’s definitely evocative of the French Foreign Legion’s conflict in Algeria. Any concert dedicated to French composers would be incomplete without an inclusion from Gabriel Fauré. The Pavane and the fourth and seventh movements (Pie Jesu and In Paradisum) of Requiem featured the voices of the EnChor choir along with the plucked strings of the cello section. The orchestra remained on stage for what was probably an intentioned, though still a generous encore with March to the Scaffold, the fourth movement from Hector Berlioz’s epic self portrait Symphonie Fantastique. The orchestra showed no signs of languor as they ready themselves for a summer hiatus. Maestro Tovey hit a perfect balance with the orchestra, coalescing strings, woodwind and brass. The mature voices of EnChor, though only heard with Pavane and Requiem brought an elegance to the concert; the last for interim conductor Morna Edmundson.